With MaggiCraft’s Instant Structures Mod (ISM) for Minecraft, you can easily search tens of thousands of structures and place them in your Minecraft world. It will allow you to assemble entire cities in a matter of minutes, explore fantastic structures, or just beautify your landscape. Part of ISM works like a search engine, just for structures, and provides functionality like a good music library. For this to work really well, ISM has a graphic user interface that displays thumbnails and much more information about structures. But to these features more in the section about the StrExplorer. With it you can find structures between a few blocks and up to 10,000,000. You can then save and place these structures. Most importantly, placing large structures is really fast. ISM supports all 13 Minecraft versions from 1.7.10 to 1.12.2 and is thus more compatible than any other Mod. Efficient searching of tens of thousands and managing your own library of structures with the StrExplorer. The fast placement of these structures within the Minecraft world. These two functions are combined in a graphical interface. The StrExplorer is like a combination of Google and Spotify. Because he offers a good search function like Google, only for structures. And it manages your chosen structures like a music library, like Spotify. 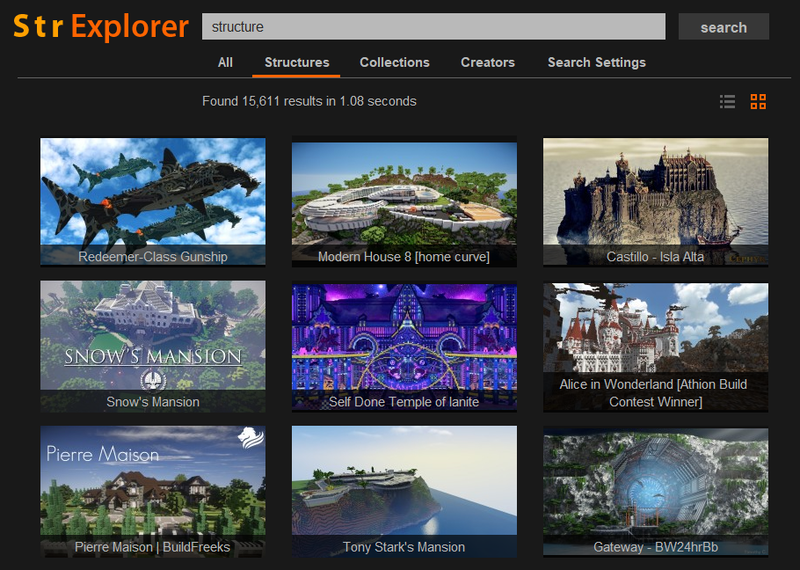 As already mentioned, you can use the search function to search tens of thousands of structures and their projects. You can also find collections that are projects with similar structures and builders of all structures. The StrExplorer maps search results to its own index, the StrRank. It correlates factors such as popularity, size, and construction to show you the most relevant structures. You can also sort and filter the results by properties such as number of blocks, size, downloads, popularity and many more. And if you do not have any ideas to search, you can search for “[all]” to show you all the structures. In the library, you manage your structures. Here you will see your structures and collections that you have saved and can place with them. ISM lists here the builders of these structures and your last placed structures. It also displays your own scanned structures and structures placed in a world. Here you can add external “schematic” files and place them with the Instant Structures Mod (ISM). Once you’ve saved the structures in your library, you can place them directly. Look for a nice and suitable place in your world click on place. Lean back and ISM places the structure for you. You can mark the area in which the structure is placed and adjust the position further. You can also rotate the structure in advance and mirror it along any axis. However, the Instant Structures Mod (ISM) is not limited to the features described above. With it you can scan your own structures, reposition structures already placed or completely removed from your Minecraft world and place geometric shapes. Select an area in your world, enter information such as title, builder and genre and scan the structure. Now you can share your structures with friends or with people from all over the world. Have you ever placed a structure not optimally? No problem, because with ISM you can reposition structures arbitrarily. Select a new position, rotate or mirror a placed structure. ISM makes these changes and replaces the now vacant parts of the surface with a backup. If you no longer like a placed structure, you can easily remove it from your world. Again, a backup of the area is placed, which includes the blocks before placing. With ISM you can not only place structures, but also geometric objects. These include cubes, circles, spheres, pyramids and many more. For all objects you can choose the blocks and options, whether geometrical shape should be hollow or tilted or not. In addition, you can replace certain blocks of a surface with others. The Instant Structures Mod (ISM) is now being developed by me, Marc Schmidt, a.k.a MaggiCraft since summer 2014. Since then, behind ISM and thus behind me is a long and exciting journey and this journey is far from over. What arose a few years ago as an offshoot from my Star Wars Mod with 13 structures, is today a search engine and library with tens of thousands of structures. Over time, I’ve added new features that users appreciate today: more structures, scanning their own structures, repositioning, and removing placed structures. But one had ISM right from the beginning, a graphical user interface. After all, what use is the access to thousands of structures if they are not prepared for the user? How useful is a structure if you do not know what it looks like and what dimensions it has before you place it? ISM is a project that has grown and grown at it. After school I started to study computer science, a step that was significantly influenced by the project around ISM. The development of the project became more and more professional and comprehensive. ISM is no longer just the mod you installed with Forge. There are Libraries to the user interface, projects to edit and add new structures, to test the mod and the export of ISM for 13 different Minecraft versions. An effort that should not be underestimated. If you want to support me in this great project, visit my Patreon page or donate something via PayPal. Of course, you can also recommend ISM to your friends, make a YouTube video or write an article about it. Best regards, Marc Schmidt, a.k.a. MaggiCraft. You can download ISM for Minecraft versions 1.7.10, 1.8, 1.8.8, 1.8.9, 1.9, 1.9.4, 1.10, 1.10.2, 1.11, 1.11.2, 1.12, 1.12.1 and 1.12.2. For the installation you need the appropriate version of Forge. ISM is not available for Minecraft Server. Your sponsorship could be linked here. Contact me for more information. Minecraft is a game by Mojang. This website and the Instant Structures Mod (ISM) are not affiliated with Mojang.